Shopping for Teenage Mutant Ninja Turtles Holiday Ornaments? Calling all TMNT fans - it's the Teenage Mutant Ninja Turtles Mini Christmas Ornament 5-Pack! 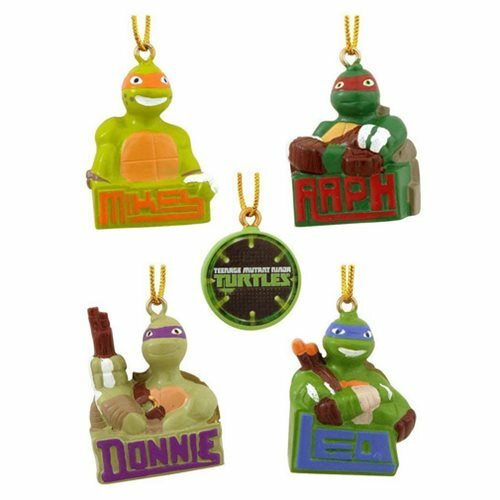 This 5-pack includes 5 miniature TMNT holiday ornaments, including 1 Donatello, 1 Raphael, 1 Michelangelo, 1 Leonardo, and 1 Teenage Mutant Ninja Turtles logo ornament. Each miniature ornament in the 5-pack measures about 1 1/2-inches tall, and features a flat back. The designs of the ornaments in the Teenage Mutant Ninja Turtles Mini Christmas Ornament 5-Pack are modeled after their appearance in the Nickelodeon TV show!